Shower Chairs, Rolling Shower Chairs, PVC Shower Chairs, Standard Shower Chairs and Sliding Transfer Shower Chairs. Scroll down to see our selection of Shower Chairs for sale. Shower chairs are widely used in hospitals, clinics, facilities and at home by every disabled or elderly patient. We have a large selection of shower chairs to meet any need. Our shower chairs include PVC shower chairs, standard rolling shower chairs, reclining shower chairs, sliding transfer shower chairs, self propelled, rehab and amputee shower chairs. Shower chairs are chairs which are not damaged by water, sometimes on wheels, used as a disability aid for bathing. 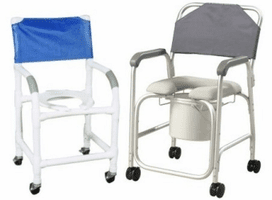 Shower chairs are portable and can be used as a bed side commode or over your toilet. Self propelled and rehab shower chairs give independence to the user and the ability to maintain personal hygiene. Reclining and amputee shower chairs support the body in a position that is most comfortable for the patient. Sliding transfer shower chairs give those with a tub shower the ability to roll up to the tub and slide over. Whatever your need, the proper shower chair can make bathing simple again..